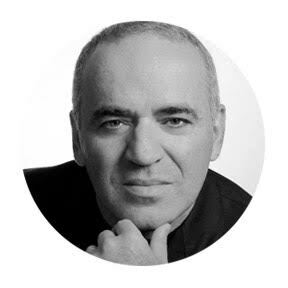 Garry Kasparov is the author of many books, most recently Winter Is Coming: Why Putin and the Enemies of the Free World Must Be Stopped, which was released in October 2015. In 1985, he came to international fame at the age of 22 as the youngest world chess champion in history. In 2005, Kasparov retired from competitive chess to join the Russian pro-democracy movement, for which he founded the United Civil Front and organized the Marches of Dissent. In 2012, Kasparov was named chairman of the New York-based Human Rights Foundation. He is also the founder of the Kasparov Chess Foundation which promotes the teaching of chess in education systems around the world. Kasparov has been a contributing editor to the Wall Street Journal since 1991 and is a regular commentator on politics and human rights. He is a Senior Visiting Fellow at the Oxford-Martin School with a focus on human-machine collaboration.